Home / Salvage Ideas / Bonkers for Bathrooms! Home / Salvage Ideas / Salvage Ideas / Bonkers for Bathrooms! Besides your bedroom, your bathroom is the next room where you spend most of your time. Whether it’s for showering, bathing, getting ready in front of the mirror or reading the newspaper on the toilet, it’s a pretty big part of your daily routine. Being such an important room in the house, it’s essential to make sure the decor is looking its best. 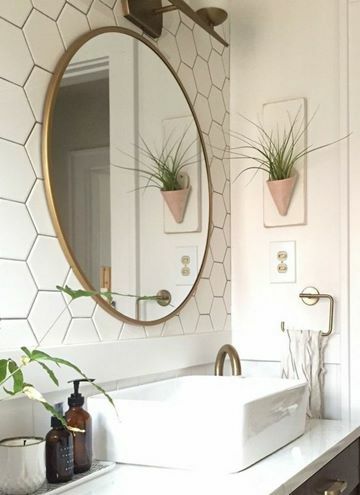 Whether your bathroom’s overdue a refresh or you just fancy switching things up a bit, we have ideas that will make you fall in love with your bathroom all over again. And relax. There’s nothing we love more than a nice soak in the bath after a long hard day at work or being out and about. We have a large variety of baths at our reclamation yard, everything from a normal tub to roll tops and cast iron. Pick your favourite up today and take it home to transform your bathroom into a room of luxury and class. 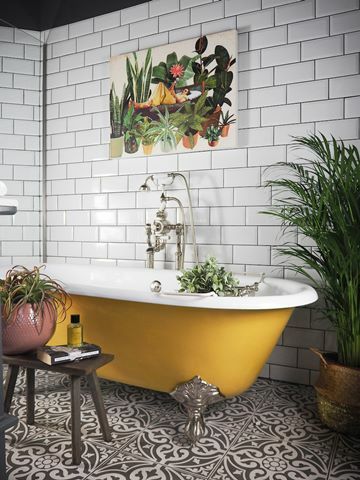 We love this bold yellow roll top bath against a tiled wall and funky flooring. There’s nothing worse than a sink that’s too small! Whether you’re washing your hands or brushing your teeth, water ends up everywhere! 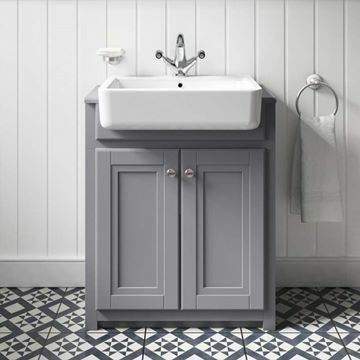 But you’ll never have to worry about splashes and spillages again with one of our Belfast sinks! Wider and deeper than standard sinks, it really will change your bathroom for the better. 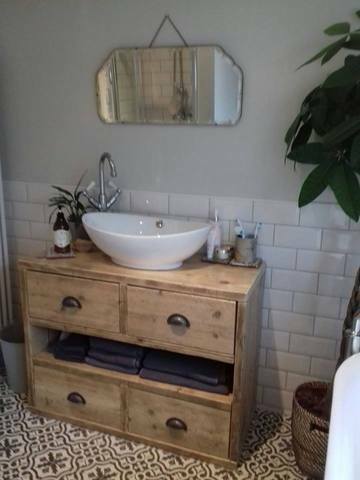 In need of more bathroom storage for towels and random bits and bobs? Don’t break the bank in buying a brand new one, take some of our reclaimed scaffold boards and build one yourself! Making your own unit means it can be whatever shape and size you want, and the natural wood effect is a great way of breaking up the ‘clinical’ look that too many tiles can sometimes create. Male or female, old or young, everyone needs a mirror during some point of the day! Whatever shape or size your bathroom needs, you can be sure to find it in our treasure trove of reproduction mirrors! If we have any advice, it would be the bigger the better! A large mirror can make the room feel bigger than it actually is and it also helps to make the room brighter for the natural light bounces off and reflects around the room, which is exactly what you need when you’re getting ready. Bathroom flooring is key. Carpet and wood just don’t cut it, it’s all about tiles. 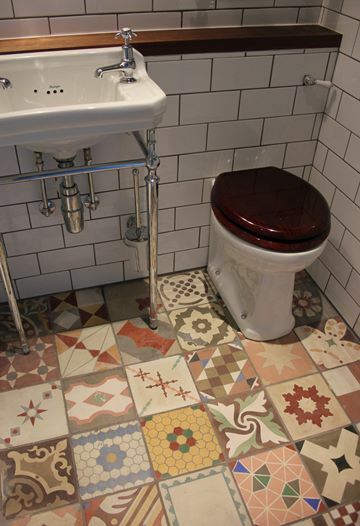 Our reproduction quarry tiles are hard-wearing, durable and stylish and would be a great addition to any bathroom. And if you want something a little more jazzy like below, why not hand-paint them or add in a few random patterned tiles to mix it up? The possibilities are endless! As with any other room in the house, finishing touches are crucial. 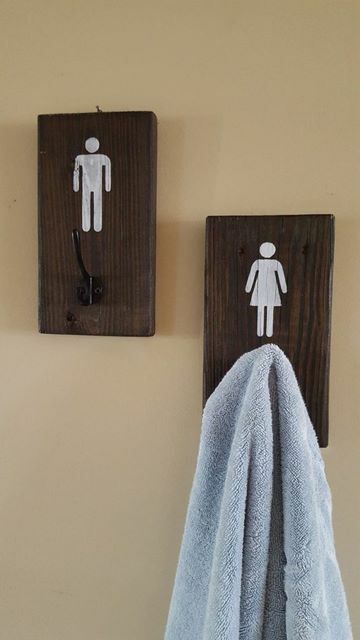 We love the idea of having a ‘his and hers’ hook to hang up towels, but this can be versatile and can be initials, pictures or even quotes, the choice is yours! To create these, simply pick up some of our hardwood timber and coat hooks, add your chosen design and they’re good to go!